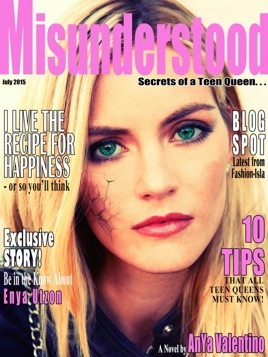 'Misunderstood – Secrets of a Teen Queen' tells the story of Enya Utzon; a true Teen Queen, who has it ALL: Money, Popularity, Friends, Beauty, dates the captain of the football team. She is a trendsetting Fashionista, jetsetter and role model. What more could anyone want? As the High School Queen of Bel Air, it's easy for Enya to assume she can have everything go her way. That's how she's used to it after all. But even for Enya, it becomes hard to keep up her perfect façade as Queen, when she starts receiving mysterious texts that delete themselves shortly after popping up. Then other and more humiliating incidents start occurring. Does any of it really lead to real happiness in life?